The debate on the peopling of Madagascar has long been dominated by historical linguistics and the observed similarities between Malagasy and Austronesian languages. 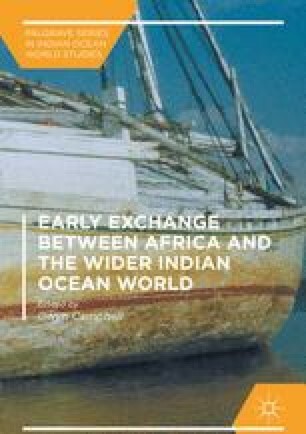 It is clear from the linguistic evidence that there have been several periods of human contact with, or migration to, Madagascar—and that these also brought different domesticates to the island (Allibert 1998, 2007; Beaujard 2011a,b; Boivin et al. 2013). Genetics is currently the main tool being used to understand the peopling of Madagascar (Hurles et al. 2005; Tofanelli et al. 2009; Murray et al. 2012; Pierron et al. 2014). However, despite recent advances in the field of genetic studies we still know very little about either the first colonisation on Madagascar or about the contacts between the populations of Madagascar, the Austronesian influence zone, and the African mainland. Moreover, Vérin and Wright (1999) have warned that inferences from linguistic and genetic studies can be misleading, and that there is often a disjuncture between language and human biology on the one hand and material culture and identity on the other.